Hello! I can't tell you how excited I am to be posting an outfit. I know it's been a couple of weeks and I feel terrible about it. This is one of my new favorite outfits though, so I'm excited to share! With a limited budget this summer I'm trying to buy tops that go with a lot of things, and this J. 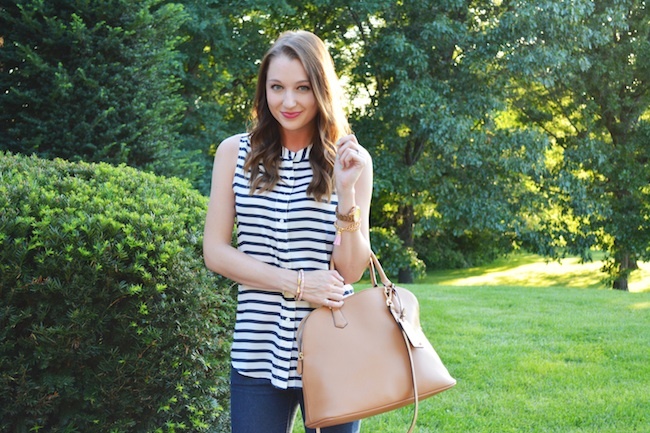 Crew Factory blouse is a perfect example! I've worn it a few times like above, but it's great with anything from denim or colorful chino shorts to being tucked into a pencil skirt for work. - I'm starting my 3rd week at my new job, and I'm absolutely loving it! - If everything goes smoothly, we should close on our house 1 week from today (knocking on wood)! I hope your week is off to a great start. Thanks for reading! you look adorable, you have so much going props to you for taking the time to blog. I bet you will be the prettiest bride. I love how simple and chic this outfit is! Those D'Orsay flats are super cute! Love your striped top and flats, so cute! love this outfit on ya ! such an adorable outfit, loving it! Love this! You are so cute and have such great, classic style. Love this top Jacy! The pink flats are the perfect pop of color too! Stunning!! Good luck with the rest of the wedding planning and congrats on the house! 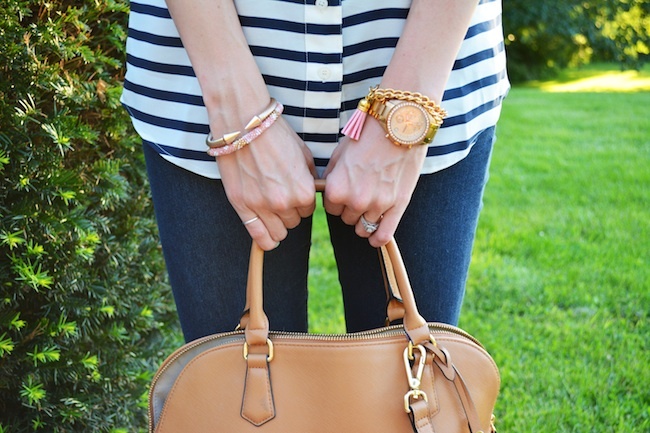 Love your casual stripes. :D here is a blog you might like www.wearona.com. Let me know what you think.